William Njobvu has paid tribute to fellow Zambian, the late Chaswe Nsofwa, after winning the Israeli league title. Nsofwa, who was at Israeli side Hapoel Be'er Sheva, collapsed during training in 2007 and later died in hospital. 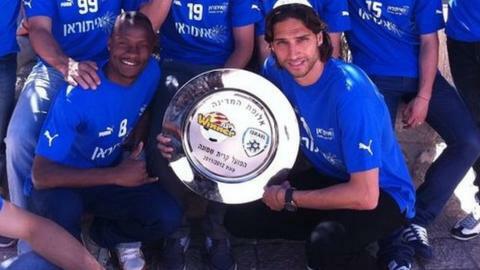 Njobvu won the Israeli title two weeks ago with Hapoel Ironi Kiryat Shmona, becoming the first Zambian to do so. "I feel so humbled to be the first Zambian to win it but credit goes to the late Nsofwa Chaswe who opened doors for us to come and play here," he said. He had started his career with Chiparamba, an academy owned by former republican president Rupiah Banda, before going onto play for Lusaka Dynamos and Zesco United. Njobvu was 20 at the time of Nsofwa's death and was one of several young Zambian players left wondering whether football was worth the risk altogether. But undeterred in 2009 Njobvu joined Kiryat Shmona, who at the time were in the second tier of the Israeli football. His gamble has now paid off as for only the second time in more than two decades a team outside the big four of Maccabi Haifa, Hapoel Tel Aviv, Maccabi Tel Aviv and Beitar Jerusalem has won the championship. "Winning the league here was one of my greatest experiences," he told BBC Sport. William Njobvu is hoping to reclaim his place in the Zambia side. "When I joined the Israeli league, I felt that this is my second step of my career and I will use it as my stepping stone to the top leagues in Europe." The 25-year-old is now looking forward to rubbing shoulders with Europe's elite next season in the Champions League. "I always expected myself to play in the champions league, the dream was always there," he said. "My move to Israel gave me so much hope and belief that one day I'd play in the Champions League. "Next season, I expect us to step up our game little more than this season because everybody knows us now. "On a personal note, it won't be easy, but with the hard work and passion for the game, anything is possible." The midfielder, who is the only African at Kiryat Shmona, has not only set his eyes on making an impression in Europe but also to reclaim a place in the Zambian national team. He was part of Zambia's squad at the 2010 Africa Cup of Nations but missed out on Chipolopolo's victory in Equatorial Guinea and Gabon through injury. "I believe we can do more than just win the African Nations Cup and I see this generation breaking more records," he insisted. "We just have to continue working for each other and not to break the spirit of brotherhood while in camp. "The sky is not the limit but rather the starting point."